The latest version of WinPatrol, a free security utility that serves as a virtual guard dog for your Windows PC, helps make the Web feel a whole lot safer than the scary place it can often seem. The 2012 version offers new ways to protect you from malware that's particularly tricky, but unfortunately, one of its key new features is only available in the $30 Plus version. WinPatrol's interface sports a few too many tabs, but, luckily, the program's many features are easy to use. The two new headline-grabbing features in WinPatrol 2012 came about, in large part, in response to both the Stuxnet and Flame malware, and the way they concealed their presence on infected systems. To that end, WinPatrol 2012 now offers Uninstall Detection, which alerts users when programs are being removed from their PC. This can be particularly useful when a virus or other type of malware attempts to remove a security application surreptitiously, though this key tool is only available to users who pay for WinPatrol's Plus version. Luckily, the free version does include an additional useful tool: Start Program Removed Detection. As the name suggests, this allows WinPatrol to alert you when another program tries to remove one of your startup programs. Past versions of WinPatrol have alerted you when new startup programs were added, so this new feature is a nice addition. These new features add to WinPatrol's already comprehensive list of features. It offers plenty of useful controls that allow you to see and change which programs start up when your PC does, and allows you to delay startup so that some programs will launch a certain time after your computer boots, which can help you get to work faster. And, like past versions, WinPatrol 2012 lets you view hidden files, cookies, and all of the programs and services running on your PC. The rub: WinPatrol's looks have not improved in the latest version. It retains the tabbed interface of past versions, which is, yes, easy enough to use, but not terribly pleasant on the eyes. Luckily, WinPatrol offers enough PC protection that its text-heavy, overly-tabbed look is forgiven. 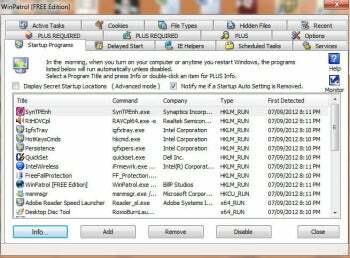 Kill off unwanted background programs like worms, adware, and spyware.